Delbert L. (Leon) Stapley was an apostle (member of the Quorum of the Twelve Apostles of The Church of Jesus Christ of Latter-day Saints, the Mormon Church. Stapley was born on December 11, 1896, in Mesa, Arizona, one of nine children born to Orley Seymour and Polly May Hunsaker Stapley. He served a full-time mission in the Southern States, and he also served in the United States Marine Corps during World War I. He married Ethel Davis in 1918, and they went on to have three children. 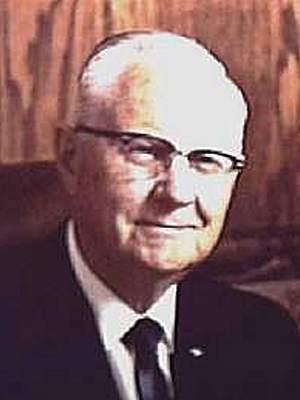 Elder Stapley served as president of the Phoenix Stake, superintendent of the Stake MIA, High Councilor in the Maricopa Stake and counselor in the Phoenix Stake Presidency. He was sustained to the Council of the Twelve and ordained an Apostle October 5, 1950, at the age of fifty-three by President George Albert Smith. He served as an apostle until his death. Stapley had been ill for several months when he died of cardiac arrest while walking near his home on August 19, 1978, in Salt Lake City. This page was last edited on 19 December 2013, at 11:12.